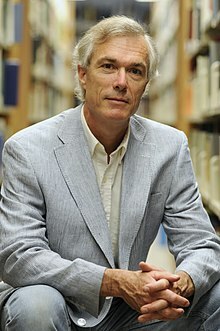 Timothy James Brook (Chinese name: 卜正民; born January 6, 1951) is a Canadian historian, sinologist, and writer specializing in the study of China (sinology). He holds the Republic of China Chair, Department of History, University of British Columbia. His research interests include the social and cultural history of the Ming Dynasty in China; law and punishment in Imperial China; collaboration during Japan's wartime occupation of China, 1937–45 and war crimes trials in Asia; global history; and historiography. Timothy Brook was born on January 6, 1951 in Toronto, Ontario in Canada, grew up in that city and currently lives in Vancouver. After graduating from the University of Toronto Schools, Brook received a bachelor's degree in English literature at the University of Toronto in 1973; a master's degree in Regional Studies–East Asia at Harvard University in 1977, and in 1984 received a Ph.D. in History and East Asian Languages at Harvard University, where his dissertation advisor was Philip A. Kuhn . From 1984–86 Brook was a MacTaggart Fellow at the University of Alberta; from 1986–97 he progressed from Assistant to Full Professor at the University of Toronto; from 1997–99 he was Professor of History at Stanford University, and 1999-2004 he was Professor of History at the University of Toronto, and Shaw Professor of Chinese at the University of Oxford. He came to University of British Columbia in 2004, and was Principal, St. John's College 2004-2009. He is also Academic Director of the Contemporary Tibetan Studies Program at the University of British Columbia's Institute of Asian Research. He was elected President of the Association for Asian Studies 2015. American Historical Review, 2012--; Handbook of Oriental Studies, Brill, Leiden; Studies in Comparative Early Modern History, University of Minnesota, Minneapolis; International Journal of Asian Studies, University of Tokyo; Journal of Ming Studies, Taipei; Ming Studies, Society for Ming Studies, New Mexico State University; Shilin 史林 (Historical studies), Shanghai. Since 2008, he has been Editor-in-chief of The History of Imperial China, a six-volume series published by Harvard University Press. (in Chinese) Wei quanli qidao: fojiao yu wan Ming Zhongguo shishen shehui de xingcheng. Nanjing: Jiangsu renmin chubanshe, 2005. The Confusions of Pleasure: Commerce and Culture in Ming China. Berkeley: University of California Press, 1998. Winner of the Joseph Levenson Book Prize of 2000. (in Czech) Čtvero ročních dob dynastie Ming: Čína v období 1368-1644. Prague: Vyšehrad, 2003. (in Chinese) Zongle de kunhuo: Mingdai de shangye yu wenhua. Beijing: Sanlian, Taipei: Linking, 2004. (in Korean) K'waerak ǔi hondon: Chungguk Myǒngdaeǔi sangǒp kwa munhwa. Seoul: Yeesan, 2005. Collaboration: Japanese Agents and Local Elites in Wartime China. Cambridge, Massachusetts: Harvard University Press, 2005. The Chinese State in Ming Society. London: Routledge Curzon, 2005. Vermeer's Hat: The Seventeenth Century and the Dawn of the Global World. New York: Bloomsbury; Toronto: Penguin; London: Profile, 2008. (in French) Le chapeau de Vermeer : Le XVIIe siècle à l'aube de la mondialisation. France: Payot, 2010. (in Italian) Il cappello di Vermeer : il Seicento e la nascita del mondo globalizzato. Turin: Einaudi, 2015. Death by a Thousand Cuts, with Jérôme Bourgon and Gregory Blue. Cambridge, Massachusetts: Harvard University Press, 2008. The Troubled Empire: China in the Yuan and Ming Dynasties. Cambridge, Massachusetts: Harvard University Press, 2010; Cambridge, Massachusetts: Belknap Press, 2013. (in Italian) La mappa della Cina del signor Selden : il commercio delle spezie, una carta perduta e il Mar Cinese Meridionale. Turin: Einaudi, 2016. (in Chinese) Zhongguo yu lishi zibenzhuyi: hanxue zhishi de xipuxue. Taipei: Chu liu tushu gongsi, 2004. Simplified character edition: Shanghai: Xinxing chubanshe, 2005. (in Chinese) Expanded Chinese translation: Nanjing datusha yingwen shiliao ji. Taibei: Shangwu yinshuguan, 2007. (in Chinese) Minzu de goujian: Yazhou jingying ji qi minzu rentong, 2008. The History of Imperial China (6 vols). Cambridge: Harvard University Press (2008-). Editor-in-chief from 2008 to date. In 2009, Vermeer's Hat won Brook the Mark Lynton History Prize from Columbia University in New York, worth $10,000 (U.S.). The prize is one of the Lukas Prize Project awards. The book was described as a "bold, original and compulsively readable work of history." Death by a Thousand Cuts was a finalist and received an honourable mention for the Professional/Scholarly Publishing (PSP) Division of the Association of American Publishers 2008 PROSE Award, in the World History and Biography/Autobiography category. ^ a b Staff (16 December 2007). "Biography - Brook, Timothy (James) (1951-): An article from: Contemporary Authors". Thomson Gale. Retrieved 2010-01-26. ^ Lumley, Elizabeth (May 2003). Canadian Who's Who 2003, Volume 38. Toronto, Ontario, Canada: University of Toronto Press. p. 172. ISBN 0-8020-8867-8. Retrieved 2010-01-27. 28th edition (May 2003). ^ a b Conrad, Peter (29 June 2008). "A time when every picture told a story". The Observer. Retrieved 2010-01-22. ^ a b c Dirda, Michael (27 January 2008). "Painting the World: How a hunger for tea and tobacco created global trade". Washington Post. Retrieved 2010-01-22. ^ a b c Staff (1 April 2009). "Vancouver writer Timothy Brook wins U.S. nonfiction prize". CBC News. Retrieved 2010-01-24. ^ a b c Staff (October 2004). "Timothy James Brook (profile)". St. John's College, University of British Columbia. Archived from the original on 2010-02-04. Retrieved 2010-01-22. ^ Staff (14 May 2008). "New Oxford China Centre launched". University of Oxford. Archived from the original on 9 June 2011. Retrieved 2010-01-28. ^ Staff (2008). "Death by a Thousand Cuts". Harvard University Press. Retrieved 2010-01-23. ^ a b c d e f Staff (c. 2015). "Timothy James Brook". University of British Columbia. Archived from the original on 2015-02-07. Retrieved 2015-03-31. ^ Mulvenon, James; Brook, Timothy (February 2000). "Quelling the People: The Military Suppression of the Beijing Democracy Movement by Timothy Brook". The Journal of Asian Studies. Association for Asian Studies. 59 (1): 145–146. doi:10.2307/2658599. JSTOR 2658599. ^ Wortzel, Larry M. (January 1994). "Quelling the People: The Military Suppression of the Beijing Democracy Movement by Timothy Brook". Australian Journal of Chinese Affairs. Contemporary China Center, Australian National University (31): 123–126. JSTOR 2949905. Volume or issue is simply shown as "No. 31". ^ Staff (11 December 2005). "FRONTLINE: The Tank Man: Interviews: Timothy Brook (edited transcript)". Public Broadcasting Service. Retrieved 2010-01-24. ^ Dreyer, June Teufel (December 1993). "Quelling the People: The Military Suppression of the Beijing Democracy Movement by Timothy Brook". The China Quarterly. Cambridge University Press on behalf of the School of Oriental and African Studies (136): 988–989. JSTOR 655602. Special Issue: Greater China (December 1993). ^ Saich, Tony; Brook, Timothy (Winter 1993–1994). "Quelling the People: The Military Suppression of the Beijing Democracy Movement by Timothy Brook". Pacific Affairs. Pacific Affairs, University of British Columbia. 66 (4): 573–574. doi:10.2307/2760686. JSTOR 2760686. ^ Barrett, T. H. (December 1994). "Praying for Power: Buddhism and the Formation of Gentry Society in Late-Ming China by Timothy Brook". International Journal of Asian Studies. Cambridge University Press. 140: 1151–1153. doi:10.1017/S0305741000053029. Retrieved 2010-01-26. ^ Naquin, Susan; Brook, Timothy (December 1995). "Praying for Power: Buddhism and The Formation of Gentry Society in Late-Ming China by Timothy Brook". Harvard Journal of Asiatic Studies. Harvard-Yenching Institute. 55 (2): 556–568. doi:10.2307/2719353. JSTOR 2719353. ^ Struve, Lynn; Brook, Timothy (June 1995). "Praying for Power: Buddhism and the Formation of Gentry Society in Late- Ming China by Timothy Brook". The American Historical Review. American Historical Association. 100 (3): 930–931. doi:10.2307/2168690. JSTOR 2168690. ^ ter Haar, Barend J. (1999). "Praying for Power: Buddhism and the Formation of Gentry Society in Late-Ming China by Timothy Brook". T'oung Pao. BRILL. 85 (4/5): 515–520. doi:10.1163/1568532992642413. JSTOR 4528819. Citation reads: "Second Series, Vol. 85, Fasc. 4/5 (1999)". ^ Yee, Danny (2005). "The Confusions of Pleasure: Commerce and Culture in Ming China". dannyreviews.com. Retrieved 2010-01-24. ^ Pye, Lucian W. (June 2005). "Collaboration: Japanese Agents and Local Elites in Wartime China". Council on Foreign Relations: Foreign Affairs. Retrieved 2010-01-24. ^ Barrett, David P. (Fall 2005). "Timothy Brook. Collaboration: Japanese Agents and Local Elites in Wartime China" (PDF). The Chinese Historical Review. The Chinese Historians in the United States, Inc. 12 (2): 339–342. Archived from the original (PDF) on 2011-07-19. Retrieved 2010-01-29. The PDF shows a listing of contents for volume 12, No.2, General Issue Number 21. See CHR web site Archived 2009-09-15 at the Wayback Machine. ^ Schoppa, R. Keith (December 2005). "Timothy Brook. Collaboration: Japanese Agents and Local Elites in Wartime China". The American Historical Review. American Historical Association. 110 (5): 1501–1502. doi:10.1086/ahr.110.5.1501. Retrieved 2010-01-29. ^ Duara, Prasenjit (January 2008). "Collaboration: Japanese Agents and Local Elites in Wartime China" (PDF). The China Journal. Contemporary China Center, Australian National University (59): 142–143. Archived from the original (PDF) on August 5, 2008. Retrieved 2010-01-29. ^ Nakajima, Gakusho (January 2006). "The Chinese State in Ming Society by Timothy Brook". International Journal of Asian Studies. Association for Asian Studies. 3 (1): 143–147. doi:10.1017/S1479591405280257. Retrieved 2010-01-26. ^ Soulliere, Ellen (June 2006). "Timothy Brook, The Chinese State in Ming Society" (PDF). New Zealand Journal of Asian Studies. New Zealand Asian Studies Society. 8 (1): 168–171. Retrieved 2010-01-28. ^ Staff (8 May 2008). "Death by a Thousand Cuts". The Times Higher Education. Retrieved 2010-01-23. ^ Staff (5 May 2008). "Death by a Thousand Cuts". The New Yorker. Retrieved 2010-01-23. ^ Waltner, Ann (2010). "Timothy Brook: The Troubled Empire: China in the Yuan and Ming Dynasties. By Timothy Brook". The Journal of Asian Studies. Cambridge University Press. 69 (4, November 2010): 1179–1181. doi:10.1017/S0021911810002159. Retrieved 2012-10-24. ^ Bol, Peter (2011). "The Troubled Empire: China in the Yuan and Ming Dynasties (review)" (PDF). Journal of Song-Yuan Studies. Project MUSE. 41: 405–410. doi:10.1353/sys.2011.0014. Retrieved 2012-10-24. ^ Maire, Stephen (11 February 2012). "The Troubled Empire: China in the Yuan and Ming Dynasties by Timothy Brook". Asian Review of Books. Cheshta Infotech Pvt Ltd. Retrieved 2012-10-24. ^ Hoffmann, Jackie (29 May 2009). "UBC Professor Wins Prestigious History Prize". Faculty of Arts, University of British Columbia. Archived from the original on 6 July 2011. Retrieved 2010-01-29. ^ Staff (2008). "Death by a Thousand Cuts: Timothy Brook, Jérôme Bourgon and Gregory Blue". Harvard University Press. Retrieved 2010-01-28. ^ Staff (5 February 2009). "Association of American Publishers Announces 2008 PROSE Award Winners". Association of American Publishers. Archived from the original (DOC) on 2011-06-09. Retrieved 2010-01-28. Staff (11 December 2005). "FRONTLINE: The Tank Man: Interviews: Timothy Brook (edited transcript)". Public Broadcasting Service. Retrieved 2010-01-24. Nappi, Carla (24 February 2012). "Timothy Brook: The Troubled Empire: China in the Yuan and Ming Dynasties". New Books in East Asian Studies. New Books Network. Archived from the original (audio) on 23 May 2013. Retrieved 2012-10-23. Roberts, Russ (February 19, 2008). "Brook on Vermeer's Hat and the Dawn of Global Trade". EconTalk. Library of Economics and Liberty. This page was last edited on 18 November 2018, at 02:39 (UTC).